This recipe is sponsored by Farm Rich. All opinions are mine alone. You know we like to get a little crazy around here and bring you recipes that are a bit “extra”. We’re appetizer fanatics, so this time we started brainstorming different things we could do with our beloved Farm Rich Mozzarella Sticks. If you haven’t had Farm Rich Mozzarella Sticks here’s what you need to know: they are delicious and oh-so-easy to make. The breading and seasoning on them is ?. 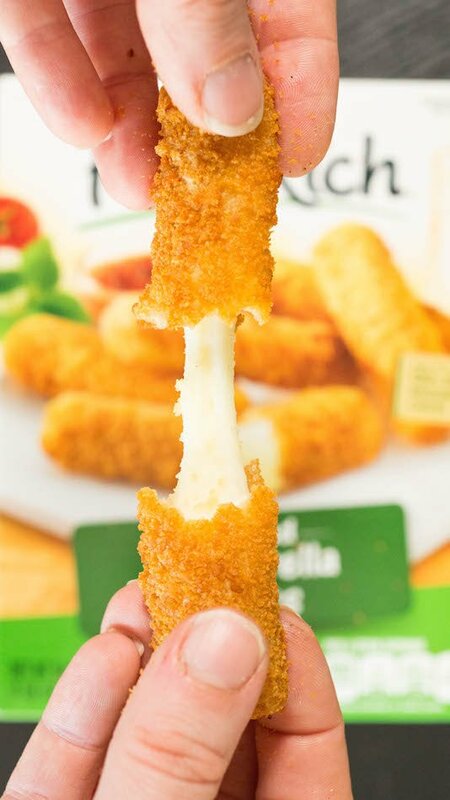 You can find the Farm Rich Mozzarella Sticks in the freezer section of your grocery store. Pop ’em in the oven anytime you want an easy appetizer, quick lunch, or my personal favorite – a late night binge! Tacos are pretty close to being a perfect food, but could we kick them up a notch? I thought so! But how? With a glorious Mozzarella Stick shell, of course! ? 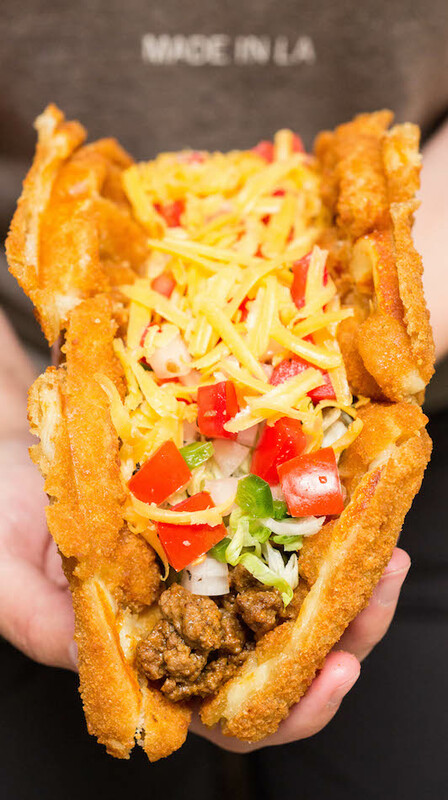 We decided to take those beautiful Farm Rich Mozzarella Sticks and waffle ’em to make a taco shell. It’s soooo incredibly easy to do and your friends and family are gonna think you’re so flippin’ cool when you serve it to them. We left our mozzarella stick waffle whole, so it was like an XL taco. Bigger is always better, right? 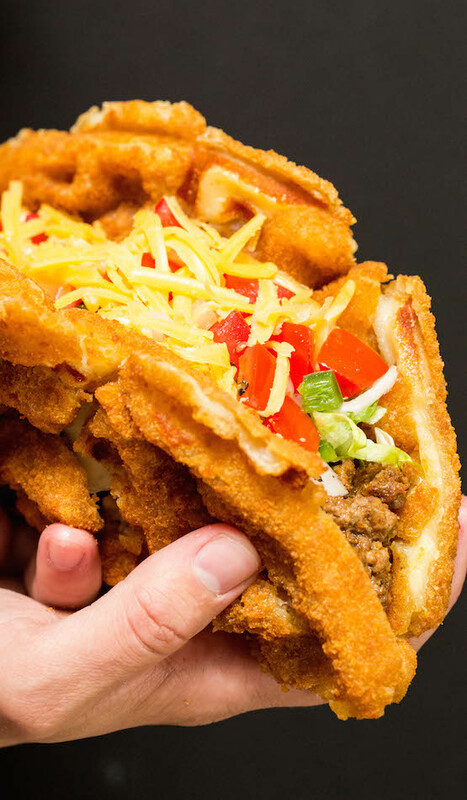 If you don’t agree, you could definitely cut the waffle in half and make a more “reasonable” and not-nearly-as-fun sized taco. We like to bake the cheese sticks, then butterfly them and then stack them on the waffle maker. If you put them in whole, you may find that your taco has a few holes in it. I’d also love to try a chicken version with sauteed peppers and onions. Yum! 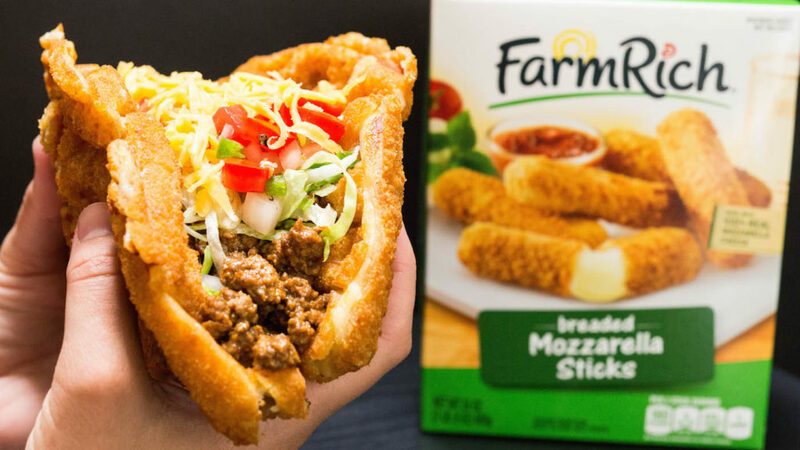 If you’re making your own Mozzarella Stick Taco, what are you filling it with? Let us know so we can try it next time! 1.Place Farm Rich Mozzarella Sticks on a baking sheet. Bake at 450 degrees F for 10-11 minutes. Remove from oven and allow to cool for a few minutes. 2. Butterfly the Mozzarella Sticks by slicing in half long ways almost all the way through, but still leaving the two halves attached. 3. Lay the butterflied Sticks cheese side up around the waffle maker end to end, making sure to fill as much of the space as possible. Once full, lay more Mozzarella Sticks on top this time, cheese side down, so that once pressed, all the cheese will melt together and help hold the waffle form. This time, try laying the Sticks opposite of how you laid the first layer and in a circular configuration. 4. Press down and close your waffle maker. Cook the Mozzarella Sticks for 4-6 minutes. 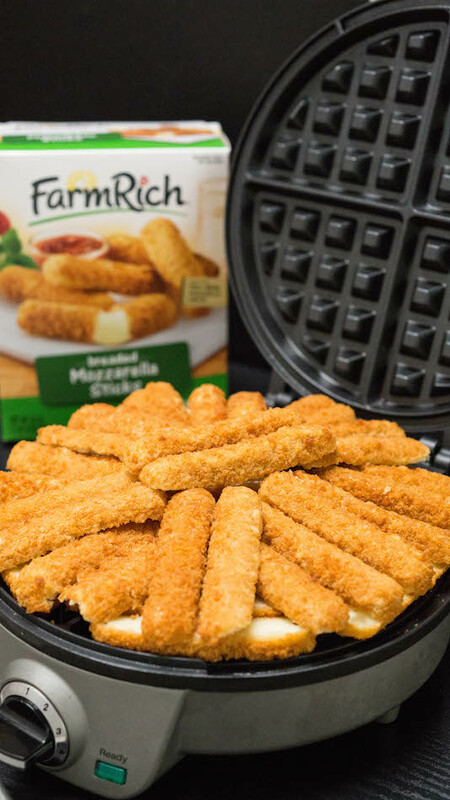 When Mozzarella Stick waffle is golden brown and sizzling, it is ready. 5. Carefully remove from your waffle maker and lay on cooling rack for a minute or two, until cool enough to handle. 6. Fill the Mozzarella Stick Taco shell with your seasoned beef, lettuce, pico de gallo, cheese, or other toppings. Oh wow! What a clever way to use mozzarella sticks. Tacos are always great in my book. Oh, I love mozzarella sticks, I wish I could this year!! Sounds so yum!! Love when you can pull the stick into a sting like this sounds so yum. Oh my goodness – this is such a FUN and creative way to use one of my favorite snack foods! Love that you’ve taco-fied it, and utilized the waffle iron. My kiddo would absolutely LOVE this for an extra special Taco Tuesday! I live (and blog) near the border in south Texas, so of course, tacos are always fine by me! This is a fun (albeit not super healthy) variation! You’ve got to live a little right? What a creative way to use mozzarella sticks! I know my kids would absolutely love this. This is so crazy and genius haha one of these perfect post night out meals! This is such a creative way to use mozzarella sticks, it looks and sound absolutely delish! This is super easy and PERFECT family dinner during the week. Mozzarella stick has always been my kiddos favorite. Very creative and super amazingly DELICIOUS! My husband just added every ingredient to this weeks shopping list!!! Mmmmm, mozzarella sticks….. Those are my favorite! I love that you waffled them – it definitely makes this “extra” like you said, lol! OH my goodness! This is insanely creative and I bet it tastes amazing. Great recipe!